If you are reporting an emergency, or an issue that's dangerous, then please call our contact centre on 0300 200 1003 (including out of hours). A report or problem that requires an immediate response is one that has a high risk of vehicle/pedestrian interaction with the likely result of serious or even fatal consequences. If you are unsure and need advice on whether you think its an emergency situation, please call this number 0300 200 1003 (including out of hours). If you report a problem online, we will inspect it within five working days. These are the responsibility of the residents of each private road. Trunk roads and motorways that cross Surrey (A3, M23, M3 and M25). Any issues and questions about the A3, M23, M3 and M25, should be directed to Highways England. being monitored as part of the routine inspections programme as the risk to public safety is not sufficient to merit any action. Please report one problem at a time, you will be given an opportunity at the end to report another problem using the personal details previously entered. We have upgraded our reporting map so that you can now see the locations where a pothole has already been reported, inspected or repaired. All red circular icons on the map show a pothole which is awaiting inspection or repair. All green triangular icons show a pothole which has been assessed and fixed (where applicable). You can click on the icons to find out further information about the pothole. If you're satisfied that we're already aware of the pothole you're concerned about, there is no need to re-report it. You can still report new potholes to us. Please note that the map is not updated in real time, and it may take up to 24 hours for it to display any newly reported, or newly fixed potholes. Which part of the road describes the problem? The area alongside the road for pedestrians to walk on. The outermost edge of the pavement. The part of the road nearest the kerb provided for cyclists. This is sometimes coloured differently to the road. The part of road along which your vehicle drives. If you would need to steer away from your driving line to avoid the problem, then choose this option. The centre of the road is the area between the carriageways where white lines are normally painted. There is one centre of road per road. Roughly what size is the pothole? Smaller than a golf ball - this is a pothole less than 2cm (0.8 inches) deep. If none of the above, is the surface breaking up? Yes, the road surface is breaking up - only use this option if the road surface is worn in multiple locations and there are no potholes that need repair. 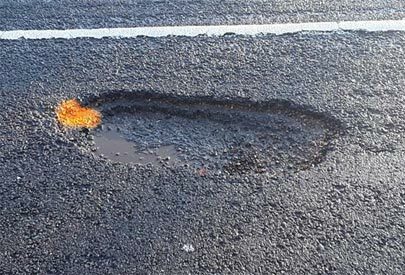 No, the road surface looks solid - use this option if you are reporting a contained patch of worn carriageway but the surrounding surface appears solid and there are no potholes that need repair. Use this option to report worn, cracked or damaged road surfaces. There is a separate option for reporting potholes. The kerbside is the outermost edge of the pavement. The cycle lane, where provided, is the part of the road nearest the kerb provided for cyclists. This is sometimes coloured differently to the road. The driving line is the part of road along which your vehicle drives. If you would need to steer away from your driving line to avoid the problem, then choose this option. What's the problem with the road surface? Breaking up – is the surface broken away in areas? Cracked – is the surface cracked? Uneven – is the surface bumpy in areas? Excessive smoothness – has the surface got an almost shiny finish on it? Edge of road damaged outside of white line – has the road broken away outside of the white line nearest the verge? Edge of road damaged inside of white line – has the road broken inside of the white line? 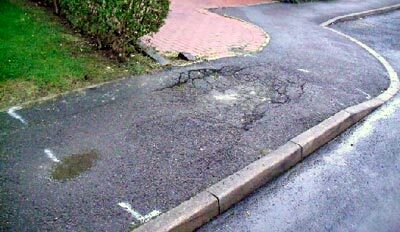 Significant amount of loose material – if the surface has broken away, is there loose material (stones, broken tarmac etc) on the surface? Are you able to say what's causing the blockage? 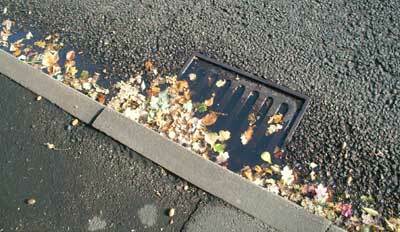 Leaves can collect after heavy rainfall and often block drains. Rubbish can also cause a problem if its not removed. Silt or soil - This can sometimes run into a drain and cause a blockage. How deep or protruding is the ironwork? If it has sunken, has it sunk less than 20mm (which is smaller than the height of a 50p piece). If it is sticking up, is it greater than 25mm (bigger than a 50p piece)? What is the problem with the drain? Loose or rocking - Is the drain loose from the frame causing it to rock? Broken, protruding and/or sunken - Is the cover broken and sticking up, or has it sunken so that it's below the edge of the pavement, road or cycle lane? 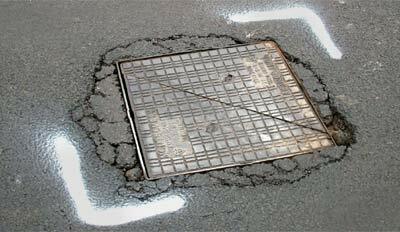 If a drain cover is missing and there is an immediate danger to road users or pedestrians please call 0300 200 103. Please use this box to tell us of any further information, for example how long has it been a problem for pedestrians or road users. Where about on the road is the flood? What is the cause of the flood? Blocked ditch - A long narrow trench in the ground, which acts as irrigation, drainage or as a boundary line. Blocked drain - This would normally be found at the edge of the road nearest the kerb. Property down-pipe - This would be visible on private property. Please use this box to tell us of any further information, for example the size or depth of the flooding, or how long it has been a problem for pedestrians/road users. Surrey County Council has responsibility for the grit bins which have a yellow icon as shown on the Surrey Winter Online map. 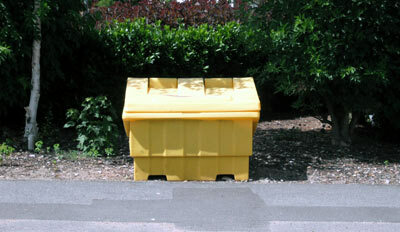 You can only report problems with grit bins maintained by Surrey County Council online. All other grit bins on the highway are privately owned and maintained either by residents or parishes. If the grit bin is empty, or if you would like to request a new grit bin, please see the grit bins page for further information. When reporting a damaged grit bin, please locate the bin number (if possible) which should be visible on the bin. Please describe the type of damage eg. lid missing, large crack causing grit to spill out etc. We have a rolling programme to refresh all road lines, so please only report a faded give way or stop line. 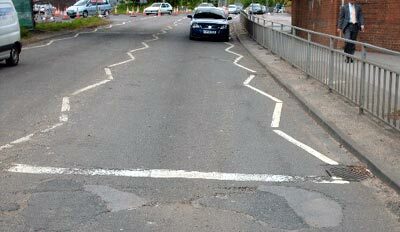 Double white line - a solid double white line, usually in the centre of the carriageway. Give way line - a dashed white line, usually found at a road junction. 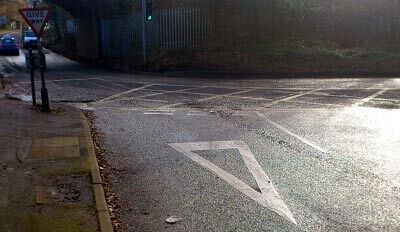 The stop line - a solid white line at a junction. Please use this box to provide any other relevant information about the lines. If you can easily identify that the cover belongs to a utility company please do not report it here. Please use the customer contacts for utility companies to report the problem to the responsible company. This is the area alongside the road for pedestrians to walk on. Where provided, this is the part of the road nearest the kerb provided for cyclists. It is sometimes coloured differently from the road. What is the problem with the ironwork? Loose and rocking - Is the cover loose from the frame causing it to rock? Is the cover sunken into the ground or is it sticking up? Has it sunken below the surface by less than 20mm which is the height of a 50p piece or if its sticking up is greater than 25mm, bigger than a 50p piece? Please use this box to tell us of any further information, for example the size or depth of the ironwork or how long it has been a problem for pedestrians/road users. Please do not use this box to report other highway issues - these need to be recorded separately. 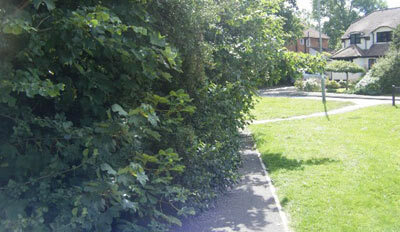 Footpath (also called the footway) - The area alongside the road for pedestrians to walk on. Kerbside - The outermost edge of the pavement. Where provided, this is the part of the road nearest the kerb provided for cyclists. This is sometimes coloured differently from the road. Verge - Often grass (but not always) and runs alongside the road or footpath. How deep or protruding is the problem? If it has sunken, has it sunk less than 20mm (smaller than the height of a 50p piece)? If it is sticking up, is greater than 25mm (bigger than the height of a 50p piece)? What is the problem with the pavement? What type of pavement or kerb is it? Cobbles - a naturally rounded small stone, commonly found in pedestrianised areas. 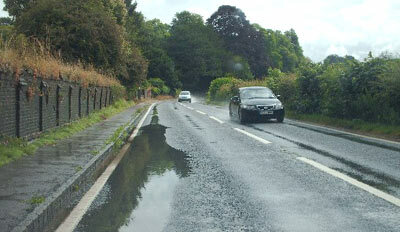 Tarmac - black asphalt, which is most commonly used to surface roads and footpaths. Block paving/slabs - large squares usually made of concrete, but can also have the appearance of brickwork. Unmade - fairly uncommon but made up of scalpings or stone. Concrete kerb - grey stones normally at the edge of the road, next to the pavement. Granite set - a rumble strip of granite blocks set in the road, usually at the entrance of a residential area to act as traffic calming. Tactile paving - often referred to as blister paving, its used to assist visually impaired people to warn of a danger ahead. Usually seen at crossing points. Is it on private property? Are you able to identify if its on a private forecourt or driveway? Please give us as much information as possible about the location and the extent of the damaged area. The level of response is dependent on the location, size and risk the tree poses to public safety. being included on a work programme in response to the enquiry and subsequent inspection. If you have any questions, please check our frequently asked questions about trees and vegetation. What is the problem with the vegetation? Is it causing an obstruction? Is the tree or vegetation making it difficult to use the footpath, are you having to step into the road to avoid the tree or vegetation? Is it obscuring a sight line? When pulling out of a road junction does the tree or vegetation block your vision, making it difficult to have clear sight of oncoming traffic?Is it obscuring a sign? Is the tree or vegetation covering or partly covering the sign making it difficult to see? Is the tree or vegetation damaging the footpath or road? Are there visible tree roots coming up through the path or road which could cause a hazard? Is there a danger of a tree or branch falling? Is there a large tree branch or tree about to break, which would cause a problem for pedestrian or road user? Are you are able to establish where the growth is coming from? Does it look to be growing or hanging over from someone's property/garden or does it appear to be on highway land (grass verge etc)? Please use this box to advise us of any further information for example the size of the vegetation (height etc) and how long has it been a problem for pedestrians/road users.